I’ve been doing a lot of thinking on commenting recently. Most of our information is out on the web already, why is it that we still have to re-enter it every time we want to make a blog post comment? Good design is all in the details and the only reason for the email form is to keep in contact, I can do that on twitter. Besides, isn’t this a little overkill? I am not a big fan of authentication badges, due to the very fact that people are not quite sure what they will be giving up or posting by clicking. I am even hesitant to click on the badges when there is no clear call-to-action what they actually will do. I decided to come up with a completely custom commenting system that is a super fast, simple and auth-free way to collect all the data needed. The solution – a wordpress twitter hybrid commenting system. It’s easy. You enter in your twitter username and comment and this pulls the avatar (transient thanks to Joe Stump’s http://tweetimag.es/), full name, location and website url. The obvious caveat is that you have to have a twitter account, but I anticipate the target audience to have one already, even if not active. Next step… comments across the web are more fragmented than ever. There needs to be a unified way to federate them together (ie Google Wave commenting example across platform). Interested to know what you guys think, leave a message in the groovy comments below. Your site is sick man! Hey Zach, it is pulling it from http://img.tweetimag.es/i/zachallia_n – when was the last time you changed it? The colors matches the person through the conversation thread. The colors are magnificent. The tech is pretty sweet too. Jun 21st, 2010	from San Francisco, Calif.
Wow interesting! But i think the only way to comment is using twitter is not a good idea. since not everyone got a twitter account. Thanks Ian, glow stick party! Thanks Manmohanjit, appreciate the RT. Hey Lien, Apple bit the bullet on floppy drives and flash. I will do the same with people who don’t have twitter accounts. Awesome job man, very smart. Nice to meet you.. big fan of your work. I like this a lot. Keep up the great work! But how do you deal with fake identification? In current comments formatting, there is nothing to stop you from leaving a comment as someone else either. I believe overall, this ease will increase communication on the site and identification verification won’t be that big of an issue. Akismet still does a great job at preventing spam. Very simple and useful, nice work. Jeff, I don’t think the point is to create a super secure, post your life type comment system. Most people leaving a comment aren’t going to put someone else’s name. If I want to talk to joey, I’ll put down my twitter ID. This is one of those rare occasions where no auth isn’t necessarily the end of the world. What if someone else uses my username here? Now you need nested comments and you’re good to go! Joey, HAI! <3 This was retweeted by someone I follow, small world! 😀 This is way sweet… love it! Ditto that. I feel that this is a great idea, although there have to be some way that allows us to authenticate the identity of the user before publishing the comment – a similar system such as OpenID could be adopted, but I believe it’ll be cumbersome. I have to second your opinion that comment management systems have gotten too diversified for people to manage – we have the default WP commenting system, Disqus, BackType and a lot other. There is a need to call for an open standard and feel that this might be the best way out. Yes, I think I am liking this. This is as brilliant as it is simple! this is a great commenting system, anyway to protect your own twitter id. Will you post some code or something to show how it’s done? I’d LOVE to be able to use this approach. It’s such an incredibly elegant solution. I’m not 100% sure I trust this. That couch is resisting that chair. Must reestablish living room furniture hierarchy. Authenticate as anyone. Love the idea, maybe if they are logged in already? It’s a great idea. Without some way to prove I am who I say I am though, I think it would be abused if put to widespread use. I imagine a heated argument where one person posts a concession as the other. Childish, yes, but those people are out there. Nice idea, I really didn’t like authentication pages, but yeah I can put someone else’s nickname and comment as it. Very nice 🙂 My only question is, why is the comment field below the comments, instead of at the top? Also, at first glance, I didn’t notice the difference b/t the bottom of the comments and the top of the tweets. Maybe you implement headers? Just a quick follow-up to my comment above: per your screenshot of IntenseDebate above, pretty much all of those components can be removed from the comment section (Facebook Connect, Twitter Sign-in, OpenID, WordPress.com login, PollDaddy Polls, After the Deadline, email subscriptions, and guest commenter info fields). You can have a completely clean comment form if you’d like. Still, I love the style of what you’ve done and I think it’d be cool to bounce around some ideas and ways we could work together. Ok, I admit – this is cool. The problem is: we could do fake coments, using real profiles. a really nice idea. is it a wordpress plugin that anyone can install? Wow, that’s crazy. Especially considering I’m not William Gibson. 2) As I said before, yes you can comment as anyone. In current comments formatting (wo auth), there is nothing to stop you from leaving a comment as someone else either. I believe overall, this ease will increase communication on the site and identification verification won’t be that big of an issue. I want people to leave connected to each other, not me. Akismet still does a great job at preventing spam. 3) Clean, simple and fast was my main intent – doing one thing really well. Don’t want to get feature crazy. Thanks to all the talented developers, designers and entrepreneurs for sharing and writing in, you guys are the best. This is a pretty rad implementation. I was thinking of something similar a while back, but glad to see someone actually do it! So this doesn’t do any authentication? Sério? E seu eu não for o verdadeiro @goozgooz? Too easy to make fake comments. No credibility. Hey Gustavo and Aprancheta, yes that is the caveat of the system. Like Matt said above “I don’t think the point is to create a super secure, post your life type comment system. Most people leaving a comment aren’t going to put someone else’s name. If I want to talk to joey, I’ll put down my twitter ID. This is one of those rare occasions where no auth isn’t necessarily the end of the world.” Beautiful work on your potfolio site btw. The only problem is spam, right? I just posted the comment above from an account that isn’t mine. Guess there is a point for auth after all. Thanks Spencer! 🙂 Yeah, this is what I was going to ask you about yesterday. Haha. Correct Florian. Beautiful work btw! This is fantastic. Very simple to understand for the current e-gen. Thanks Daniel, I’ll see ya soon. Nikhil, love your site. What are you using for CMS? Twitter commenting system, bah! This internet thing is never going to take off. Jump on the bandwagon why don’t you. 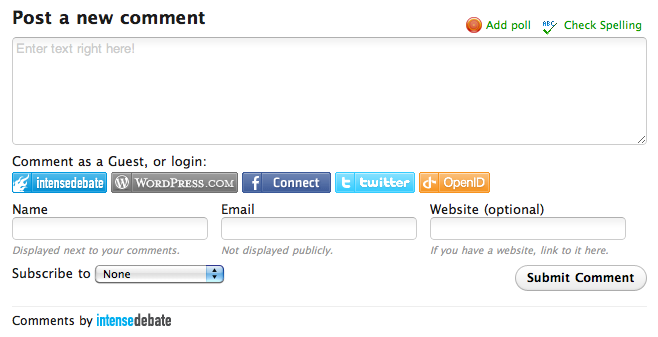 Oauth 4 eva! The auth-free is probably bad. You are a genius, love your work! Keep up the great job. wow joey. i’m LOVING this commenting system! trying to figure out how I can implement it on @101in365. you are r0x0rs. as usual! You are a rockstar Jenn, already checking off some 101s. @jennjenn Do you mean for the blog? If it is a wordpress CMS you can use it. Or do you mean building it custom on the site? You are universe denting divine : ) Absolutely brilliant – Robot round of applause – fembot seal of approval. It’d be cool if the system remembered who you are so you don’t need to type your twitter name each time. Hey Mike, it should do that for you already. This is very very cool. Nice! ^ that was me. Not trying to dog the system that you have here, but do you have plans/ideas to deal with that? Hey Ryan, thanks for testing it out. Long time no talk, hope you are doing well! 🙂 I addressed your questions you had above in the comments. Feel free to shoot me an email jprimiani@gmail.com if you want to chat further. Doesn’t it mean you can comment as other people? I like this. What about threaded conversations though? Aug 3rd, 2010	from The Internets. Thanks everyone – I really appreciate it! 🙂 Ben, it is moderated by IP. Threading is something that adds complexity, don’t feel it is necessary for this implementation – keeping it fast and simple. This is great! But how can it be sure I’m not posting from another person’s account name? excellent UI. using this on my own blog soon. This is incredible, I love the side glow stick thing. What an Idea! sirji… gr8 effort! Can I suggest a “leave regular” comment for those with out Twitter. Don’t want to exclude. Interesting looking system. Will be keeping it in mind for my site thats currently in progress. Nov 11th, 2010	from Brisbane, home of me. Love the overall idea… but, what about users that don’t have a Twitter account? wow. this is interesting. what is the difference with the colour on left hand side? Dec 8th, 2010	from Tokyo, Japan. this is brilliant, absolutely love it! I thoroughly endorse these comments! Wonderful sharp post. Never thought that it was so simple. Extolment to you! Would love to see this working on Tumblr. Howdy! Quick question that’s completely off topic. Do you know how to make your site mobile friendly? My blog looks weird when viewing from my iphone. I’m trying to find a template or plugin that might be able to correct this problem. If you have any recommendations, please share. Thank you! Woh I really like your website posts, saved to favorites ! . I do not comment, but I browsed a bunch of responses on Introducing A Simpler Blog Commenting System Joey Primiani | Pioneering the New Internet Revolution. I actually do have a few questions for you if you don’t mind. Is it simply me or do some of the remarks appear like they are written by brain dead people? 😛 And, if you are posting on other online social sites, I would like to follow anything fresh you have to post. Would you list of every one of all your social pages like your twitter feed, Facebook page or linkedin profile? Hello. Impressive job you done here dude. I didn’t imagine this. It’s a splendid story. Thanking you! Minha super bolsista @andressa_alb veja isto que bacana > http://bit.ly/cxKQz8 leia os comentários tb pra mais infos... beeeem legal! Introducing a simpler blog commenting system by @jp http://jprim.com/introducing-a-simpler-blog-commenting-system/ //simply amazing!